BROOKINGS, S.D. – Prairie AquaTech is a small company now, but developers say if it can help farmers in the Dakotas and Minnesota capitalize as a substitute for high-demand fishmeal on the world’s fish farms, it could bloom into something bigger. Created in 2012 as DAST LLC, Prairie AquaTech is developing an enhanced microbial conversion to produce high-protein feed that is converted into pellets for aquaculture. The same processes can be used to make feed for other farm animals, pets and humans. Prairie AquaTech lives in a $2 million, three-pilot production facility and a research-scale pilot facility. The plant includes a mini-version of a full feed mill for making whole feed pellets, an analytical lab for testing raw materials and a 7,500 square-foot recirculating aquaculture facility lab. It has tanks ranging from 30 to 1,000 gallons in various configurations for replicated feeding trials. The company is raising funds for a $40 million facility that would produce 30,000 tons of feed pellets per year, which would start construction in April 2017 and take ten months to build. Brookings or Volga, S.D. are likely locations, although that announcement is anticipated this fall. Bill Gibbons, an industrial microbiologist and professor at South Dakota State University in Brookings, S.D. and Mike Brown of SDSU’s Natural Resource Management Department are “co-chief science officers” at the company. Mark Luecke is the CEO and managing director for the company, as well as South Dakota Innovation Partners, a venture capital company that focuses on the early stages of public-private partnerships involving university research. SDIP helps fledgling companies with capital and management. “If we’re able to grow our inputs into the aquaculture market, which is primarily feed and represents 50 to 75 percent of the cost of doing business in aquaculture, then there’s a great chance for us to turn the tables on our trade balance and become an exporter of seafood, instead of an importer,” Luecke says. Gibbons says it’s a fact that the world needs to double its food production in the next 20 to 30 years, and fish is likely to be an increasingly important source of protein. Shellfish and fish consumption are on the rise, in part because of improving standards of living in parts of the world, and in part because of a feed conversion for fish. The U.S. imports more than 80 percent of the seafood Americans consume. (Aquaculture imports are the second-largest natural resource input for the U.S. – behind oil.) Much of our imports come from China and Vietnam, and much of the fish are grown in lagoon-type situations and are sometimes poorly inspected, Gibbons says. China is the largest producer, with 50 to 60 percent of worldwide production. They raise them in the open ocean, estuaries, pens, rivers, recirculating tanks or ponds on dry land. The U.S. Department of Agriculture and the Food and Drug Administration are trying to get more fish production – both “fin fish” and shrimp. Wild-caught fish production started flattening in the 1980s and aquaculture started growing to fill the gap. Aquaculture has been growing 9 to 10 percent annually for the past 20 to 30 years. In 2010, global aquaculture hit a milestone when it exceeded global beef production. Cattle require 7 to 8 pounds of feed per pound of meat produced, while fish take only 1 to 1.2 pounds of feed to produce a pound of fish. Traditionally, aquaculture has been heavily dependent on increasingly expensive fishmeal as a protein source, accounting for 40 to 50 percent of the total feed for aquaculture. Fishmeal comes from wild-caught herring, menhaden and anchovies. Using these ocean-going “forage” species, oil is extracted and the fish are ground for fishmeal. A small amount comes from fish heads and other organs. In the 1960s, the chicken and hog industries consumed most of the fishmeal. By 2010, nearly 80 percent of the world fishmeal went to aquaculture. Fishmeal prices have increased from $700 per ton in 2004 to $2,000 per ton and some experts say it will go to $3,000 per ton within five years. Consumers and fish marketers recently have been trying to reduce the practice of feeding fishmeal to farm-raised fish, based on sustainability motives. “The ideal is to have zero fish going in, and one unit of fish coming out,” Gibbons says. Plant-based feed stocks have promise. Soybean and distiller grains from corn were potential sources, replacing about 25 percent of the fishmeal. The problem is the plant-based feeds have fiber and anti-nutritional factors that irritate stomachs of fish, and can even kill them. On a hunting trip in 2011, Brown told Gibbons about the digestibility issue and Gibbons saw an opportunity. Gibbons did some limited trials and found the organisms were effective in reducing the sugar and fiber levels, and boosted the protein levels significantly. On a dry matter basis, conventional soybean meal yields about 50 to 52 percent protein. Gibbons’ process boosts that level to almost 70 percent. “With fishmeal, for every pound of protein going in, the fish use about 78 percent of that and convert that into fish,” Gibbons says. “When we’re doing our trials, we’re seeing almost 100 percent of that going in, ending up in the fish.” That not only cuts fish food costs, but it also means nutrients that aren’t absorbed by the fish don’t go into the water, where it has to be treated before the water can be reused in the system. There is a global race to create new fish foods for the aquaculture business. Raw soybean meal costs $400 per ton. By adding another $400 to $500 per ton in processing costs, the product can likely compete in the market at $1,500 per ton. Gibbons says the public-private partnership has re-energized his research career. He gives a great deal of credit for the project to David Chicoine, the outgoing South Dakota State University president, who came from Illinois where he led university efforts to commercialize faculty inventions. At SDSU, Chicoine established an independent Technology Transfer Office. Invention disclosures by staff increased from a handful per year to about 50 per year. 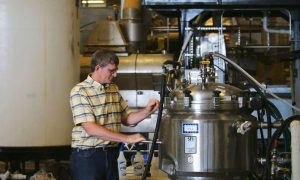 The university applies for patents on the most promising prospects, including those at Prairie AquaTech. Chicoine was also instrumental in establishing South Dakota Innovation Partners, which was formed by business leaders and bankers, including McGowan Capital Group. The group accumulated about $6 million to fund activities, and provide human resources, payroll, data management and other things researchers might need in start-up companies. SDIP has a portfolio of about a half-dozen companies, including Prairie AquaTech, which is one of the most advanced in commercialization. Other ag-related companies are called Medgene Labs, which develops diagnostic and therapeutic products for infectious diseases in animal and human health; Novita, which extracts natural oils from distillers’ grain to make lubricants and fuel; and Cyanosun Energy, which captures carbon dioxide from ethanol and power production to make high-value chemicals. The South Dakota Soybean Council provided funds for Brown’s aquaculture system. Dakota Ethanol in Wentworth, S.D. and Redfield Energy in Redfield, S.D. have both provided infrastructure. Research funding has also been obtained from NSF and USDA, as well as commodity groups such as the United Soybean Board and Minnesota Corn Growers. He says the project has revitalized his research career and he tells colleagues if they have a marketable idea, “don’t hold it so tight that you suffocate it”. He says academic goals are “almost 180 degrees different” than business goals. Researchers are looking for new ideas and explanations for how things work. Business people are trying to get an economically viable product out the door. “The business people say that if it works, we’re going to market,” Gibbons says. Article as published in the Prairie Business Magazine.